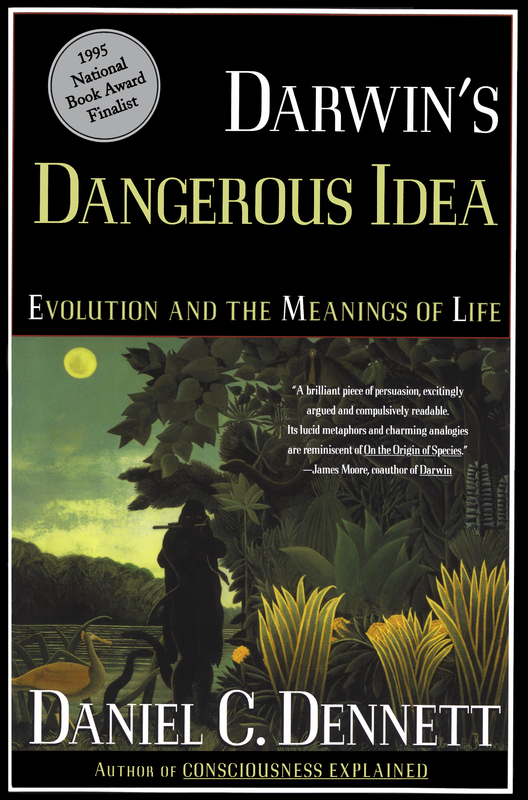 In a book that is both groundbreaking and accessible, Daniel C. Dennett, whom Chet Raymo of The Boston Globe calls "one of the most provocative thinkers on the planet," focuses his unerringly logical mind on the theory of natural selection, showing how Darwin's great idea transforms and illuminates our traditional view of humanity's place in the universe. Dennett vividly describes the theory itself and then extends Darwin's vision with impeccable arguments to their often surprising conclusions, challenging the views of some of the most famous scientists of our day. Tell me why the sky's so blue. Because God made the sky so blue. This straightforward, sentimental declaration still brings a lump to my throat -- so sweet, so innocent, so reassuring a vision of life! And then along comes Darwin and spoils the picnic. Or does he? That is the topic of this book. From the moment of the publication of Origin of Species in 1859, Charles Darwin's fundamental idea has inspired intense reactions ranging from ferocious condemnation to ecstatic allegiance, sometimes tantamount to religious zeal. Darwin's theory has been abused and misrepresented by friend and foe alike. It has been misappropriated to lend scientific respectability to appalling political and social doctrines. It has been pilloried in caricature by opponents, some of whom would have it compete in our children's schools with "creation science," a pathetic hodgepodge of pious pseudo-science. Almost no one is indifferent to Darwin, and no one should be. The Darwinian theory is a scientific theory, and a great one, but that is not all it is. The creationists who oppose it so bitterly are right about one thing: Darwin's dangerous idea cuts much deeper into the fabric of our most fundamental beliefs than many of its sophisticated apologists have yet admitted, even to themselves. The sweet, simple vision of the song, taken literally, is one that most of us have outgrown, however fondly we may recall it. The kindly God who lovingly fashioned each and every one of us (all creatures great and small) and sprinkled the sky with shining stars for our delight -- that God is, like Santa Claus, a myth of childhood, not anything a sane, undeluded adult could literally believe in. That God must either be turned into a symbol for something less concrete or abandoned altogether. Not all scientists and philosophers are atheists, and many who are believers declare that their idea of God can live in peaceful coexistence with, or even find support from, the Darwinian framework of ideas. Theirs is not an anthropomorphic Handicrafter God, but still a God worthy of worship in their eyes, capable of giving consolation and meaning to their lives. Others ground their highest concerns in entirely secular philosophies, views of the meaning of life that stave oft despair without the aid of any concept of a Supreme Being -- other than the Universe itself. Something is sacred to these thinkers, but they do not call it God; they call it, perhaps, Life, or Love, or Goodness, or Intelligence, or Beauty, or Humanity. What both groups share, in spite of the differences in their deepest creeds, is a conviction that life does have meaning, that goodness matters. But can any version of this attitude of wonder and purpose be sustained in the face of Darwinism? From the outset, there have been those who thought they saw Darwin letting the worst possible cat out of the bag: nihilism. They thought that if Darwin was right, the implication would be that nothing could be sacred. To put it bluntly, nothing could have any point. Is this just an overreaction? What exactly are the implications of Darwin's idea -- and, in any case, has it been scientifically proven or is it still "just a theory"? Perhaps, you may think, we could make a useful division: there are the parts of Darwin's idea that really are established beyond any reasonable doubt, and then there are the speculative extensions of the scientifically irresistible parts. Then -- if we were lucky -- perhaps the rock-solid scientific facts would have no stunning implications about religion, or human nature, or the meaning of life, while the parts of Darwin's idea that get people all upset could be put into quarantine as highly controversial extensions of, or mere interpretations of, the scientifically irresistible parts. That would be reassuring. But alas, that is just about backwards. There are vigorous controversies swirling around in evolutionary theory, but those who feel threatened by Darwinism should not take heart from this fact. Most -- if not quite all -- of the controversies concern issues that are "just science"; no matter which side wins, the outcome will not undo the basic Darwinian idea. That idea, which is about as secure as any in science, really does have far-reaching implications for our vision of what the meaning of life is or could be. In 1543, Copernicus proposed that the Earth was not the center of the universe but in fact revolved around the Sun. It took over a century for the idea to sink in, a gradual and actually rather painless transformation. (The religious reformer Philipp Melanchthon, a collaborator of Martin Luther, opined that "some Christian prince" should suppress this madman, but aside from a few such salvos, the world was not particularly shaken by Copernicus himself.) The Copernican Revolution did eventually have its own "shot heard round the world": Galileo's Dialogue Concerning the Two Chief World Systems, but it was not published until 1632, when the issue was no longer controversial among scientists. Galileo's projectile provoked an infamous response by the Roman Catholic Church, setting up a shock wave whose reverberations are only now dying out. But in spite of the drama of that epic confrontation, the idea that our planet is not the center of creation has sat rather lightly in people's minds. Every schoolchild today accepts this as the matter of fact it is, without tears or terror. In due course, the Darwinian Revolution will come to occupy a similarly secure and untroubled place in the minds -- and hearts -- of every educated person on the globe, but today, more than a century after Darwin's death, we still have not come to terms with its mind-boggling implications. Unlike the Copernican Revolution, which did not engage widespread public attention until the scientific details had been largely sorted out, the Darwinian Revolution has had anxious lay spectators and cheerleaders taking sides from the outset, tugging at the sleeves of the participants and encouraging grandstanding. The scientists themselves have been moved by the same hopes and fears, so it is not surprising that the relatively narrow conflicts among theorists have often been not just blown up out of proportion by their adherents, but seriously distorted in the process. Everybody has seen, dimly, that a lot is at stake. Moreover, although Darwin's own articulation of his theory was monumental, and its powers were immediately recognized by many of the scientists and other thinkers of his day, there really were large gaps in his theory that have only recently begun to be properly filled in. The biggest gap looks almost comical in retrospect. In all his brilliant musings, Darwin never hit upon the central concept, without which the theory of evolution is hopeless: the concept of a gene. Darwin had no proper unit of heredity, and so his account of the process of natural selection was plagued with entirely reasonable doubts about whether it would work. Darwin supposed that offspring would always exhibit a sort of blend or average of their parents' features. Wouldn't such "blending inheritance" always simply average out all differences, turning everything into uniform gray? How could diversity survive such relentless averaging? Darwin recognized the seriousness of this challenge, and neither he nor his many ardent supporters succeeded in responding with a description of a convincing and well-documented mechanism of heredity that could combine traits of parents while maintaining an underlying and unchanged identity. The idea they needed was right at hand, uncovered ("formulated" would be too strong) by the monk Gregor Mendel and published in a relatively obscure Austrian journal in 1865, but, in the best-savored irony in the history of science, it lay there unnoticed until its importance was appreciated (at first dimly) around 1900. Its triumphant establishment at the heart of the "Modern Synthesis" (in effect, the synthesis of Mendel and Darwin) was eventually made secure in the 1940s, thanks to the work of Theodosius Dobzhansky, Julian Huxley, Ernst Mayr, and others. It has taken another half-century to iron out most of the wrinkles of that new fabric. The fundamental core of contemporary Darwinism, the theory of DNA-based reproduction and evolution, is now beyond dispute among scientists. It demonstrates its power every day, contributing crucially to the explanation of planet-sized facts of geology and meteorology, through middle-sized facts of ecology and agronomy, down to the latest microscopic facts of genetic engineering. It unifies all of biology and the history of our planet into a single grand story. Like Gulliver tied down in Lilliput, it is unbudgeable, not because of some one or two huge chains of argument that might -- hope against hope -- have weak links in them, but because it is securely tied by hundreds of thousands of threads of evidence anchoring it to virtually every other area of human knowledge. New discoveries may conceivably lead to dramatic, even "revolutionary" shifts in the Darwinian theory, but. the hope that it will be "refuted" by some shattering breakthrough is about as reasonable as the hope that we will return to a geocentric vision and discard Copernicus. Still, the theory is embroiled in remarkably hot-tempered controversy, and one of the reasons for this incandescence is that these debates about scientific matters are usually distorted by fears that the "wrong" answer would have intolerable moral implications. So great are these fears that they are carefully left unarticulated, displaced from attention by several layers of distracting rebuttal and counter-rebuttal. The disputants are forever changing the subject slightly, conveniently keeping the bogeys in the shadows. It is this misdirection that is mainly responsible for postponing the day when we can all live as comfortably with our new biological perspective as we do with the astronomical perspective Copernicus gave us. The Darwinian Revolution is both a scientific and a philosophical revolution, and neither revolution could have occurred without the other. As we shall see, it was the philosophical prejudices of the scientists, more than their lack of scientific evidence, that prevented them from seeing how the theory could actually work, but those philosophical prejudices that had to be overthrown were too deeply entrenched to be dislodged by mere philosophical brilliance. It took an irresistible parade of hard-won scientific facts to force thinkers to take seriously the weird new outlook that Darwin proposed. Those who are still ill-acquainted with that beautiful procession can be forgiven their continued allegiance to the pre-Darwinian ideas. And the battle is not yet over; even among the scientists, there are pockets of resistance. Let me lay my cards on the table. If I were to give an award for the single best idea anyone has ever had, I'd give it to Darwin, ahead of Newton and Einstein and everyone else. In a single stroke, the idea of evolution by natural selection unifies the realm of life, meaning, and purpose with the realm of space and time, cause and effect, mechanism and physical law. But it is not just a wonderful scientific idea. It is a dangerous idea. My admiration for Darwin's magnificent idea is unbounded, but I, too, cherish many of the ideas and ideals that it seems to challenge, and want to protect them. For instance, I want to protect the campfire song, and what is beautiful and true in it, for my little grandson and his friends, and for their children when they grow up. There are many more magnificent ideas that are also jeopardized, it seems, by Darwin's idea, and they, too, may need protection. The only good way to do this -- the only way that has a chance in the long run -- is to cut through the smokescreens and look at the idea as unflinchingly, as dispassionately, as possible. On this occasion, we are not going to settle for "There, there, it will all come out all right." Our examination will take a certain amount of nerve. Feelings may get hurt. Writers on evolution usually steer clear of this apparent clash between science and religion. Fools rush in, Alexander Pope said, where angels fear to tread. Do you want to follow me? Don't you really want to know what survives this confrontation? What if it turns out that the sweet vision -- or a better one -- survives intact, strengthened and deepened by the encounter? Wouldn't it be a shame to forgo the opportunity for a strengthened, renewed creed, settling instead for a fragile, sickbed faith that you mistakenly supposed must not be disturbed? There is no future in a sacred myth. Why not? Because of our curiosity. Because, as the song reminds us, we want to know why. We may have outgrown the song's answer, but we will never outgrow the question. Whatever we hold precious, we cannot protect it from our curiosity, because being who we are, one of the things we deem precious is the truth. Our love of truth is surely a central element in the meaning we find in our lives. In any case, the idea that we might preserve meaning by kidding ourselves is a more pessimistic, more nihilistic idea than I for one can stomach. If that were the best that could be done, I would conclude that nothing mattered after all. This book, then, is for those who agree that the only meaning of life worth caring about is one that can withstand our best efforts to examine it. Others are advised to close the book now and tiptoe away. For those who stay, here is the plan. Part I of the book locates the Darwinian Revolution in the larger scheme of things, showing how it can transform the world-view of those who know its details. This first chapter sets out the background of philosophical ideas that dominated our thought before Darwin. Chapter 2 introduces Darwin's central idea in a somewhat new guise, as the idea of evolution as an algorithmic process, and clears up some common misunderstandings of it. Chapter 3 shows how this idea overturns the tradition encountered in chapter 1. Chapters 4 and 5 explore some of the striking -- and unsettling -- perspectives that the Darwinian way of thinking opens up. Part II examines the challenges to Darwin's idea -- to neo-Darwinism or the Modern Synthesis -- that have arisen within biology itself, showing that contrary to what some of its opponents have declared, Darwin's idea survives these controversies not just intact but strengthened. Part III then shows what happens when the same thinking is extended to the species we care about most: Homo sapiens. Darwin himself fully recognized that this was going to be the sticking point for many people, and he did what he could to break the news gently. More than a century later, there are still those who want to dig a moat separating us from most if not all of the dreadful implications they think they see in Darwinism. Part III shows that this is an error of both fact and strategy; not only does Darwin's dangerous idea apply to us directly and at many levels, but the proper application of Darwinian thinking to human issues -- of mind, language, knowledge, and ethics, for instance -- illuminates them in ways that have always eluded the traditional approaches, recasting ancient problems and pointing to their solution. Finally, we can assess the bargain we get when we trade in pre-Darwinian for Darwinian thinking, identifying both its uses and abuses, and showing how what really matters to us -- and ought to matter to us -- shines through, transformed but enhanced by its passage through the Darwinian Revolution. 2. What, Where, When, Why -- And How? Our curiosity about things takes different forms, as Aristotle noted at the dawn of human science. His pioneering effort to classify them still makes a lot of sense. He identified four basic questions we might want answered about anything, and called their answers the four aitia, a truly untranslatable Greek term traditionally but awkwardly translated the four "causes." (1) We may be curious about what something is made of, its matter or material cause. (2) We may be curious about the form (or structure or shape) that that matter takes, its formal cause. (3) We may be curious about its beginning, how it got started, or its efficient cause. (4) We may be curious about its purpose or goal or end (as in "Do the ends justify the means?" ), which Aristotle called its telos, sometimes translated in English, awkwardly, as "final cause." It takes some pinching and shoving to make these four Aristotelian aitia line up as the answers to the standard English questions "what, where, when, and why." The fit is only fitfully good. Questions beginning with "why," however, do standardly ask for Aristotle's fourth "cause," the telos of a thing. Why this? we ask. What is it for? As the French say, what is its raison d'être, or reason for being? For hundreds of years, these "why" questions have been recognized as problematic by philosophers and scientists, so distinct that the topic they raise deserves a name: teleology. "Why are you sawing that board?" "And what is the door for?" "And why do you want a secure house?" "So I can sleep nights." "And why do you want to sleep nights?" "Go run along and stop asking such silly questions." This exchange reveals one of the troubles with teleology: where does it all stop? What final final cause can be cited to bring this hierarchy of reasons to a close? Aristotle had an answer: God, the Prime Mover, the for-which to end all for-whiches. The idea, which is taken up by the Christian, Jewish, and Islamic traditions, is that all our purposes are ultimately God's purposes. The idea is certainly natural and attractive. If we look at a pocket watch and wonder why it has a clear glass crystal on its face, the answer obviously harks back to the needs and desires of the users of watches, who want to tell time, by looking at the hands through the transparent, protective glass, and so forth. If it weren't for these facts about us, for whom the watch was created, there would be no explanation of the "why" of its crystal. If the universe was created by God, for God's purposes, then all the purposes we can find in it must ultimately be due to God's purposes. But what are God's purposes? That is something of a mystery. One way of deflecting discomfort about that mystery is to switch the topic slightly. Instead of responding to the "Why" question with a "because"-type answer (the sort of answer it seems to demand), people often substitute a "how" question for the "why" question, and attempt to answer it by telling a story about how it came to be that God created us and the rest of the universe, without dwelling overmuch on just why God might want to have done that. The "how" question does not get separate billing on Aristotle's list, but it was a popular question and answer long before Aristotle undertook his analysis. The answers to the biggest "how" questions are cosmogonies, stories about how the cosmos, the whole universe and all its denizens, came into existence. The book of Genesis is a cosmogony, but there are many others. Cosmologists exploring the hypothesis of the Big Bang, and speculating about black holes and super-strings, are present-day creators of cosmogonies. Not all ancient cosmogonies follow the pattern of an artifact-maker. Some involve a "world egg" laid in "the Deep" by one mythic bird or another, and some involve seeds' being sown and tended. Human imagination has only a few resources to draw upon when faced with such a mind-boggling question. One early creation myth speaks of a "self-existent Lord" who, "with a thought, created the waters, and deposited in them a seed which became a golden egg, in which egg he himself is born as Brahma, the progenitor of the worlds" (Muir 1972, vol. IV, p. 26). And what's the point of all this egg-laying or seed-sowing or world-building? Or, for that matter, what's the point of the Big Bang? Today's cosmologists, like many of their predecessors throughout history, tell a diverting story, but prefer to sidestep the "why" question of teleology. Does the universe exist for any reason? Do reasons play any intelligible role in explanations of the cosmos? Could something exist for a reason without its being somebody's reason? Or are reasons -- Aristotle's type (4) causes -- only appropriate in explanations of the works and deeds of people or other rational agents? If God is not a person, a rational agent, an Intelligent Artificer, what possible sense could the biggest "why" question make? And if the biggest "why" question doesn't make any sense, how could any smaller, more parochial, "why" questions make sense? One of Darwin's most fundamental contributions is showing us a new way to make sense of "why" questions. Like it or not, Darwin's idea offers one way -- a clear, cogent, astonishingly versatile way -- of dissolving these old conundrums. It takes some getting used to, and is often misapplied, even by its staunchest friends. Gradually exposing and clarifying this way of thinking is a central project of the present book. Darwinian thinking must be carefully distinguished from some oversimplified and all-too-popular impostors, and this will take us into some technicalities, but it is worth it. The prize is, for the first time, a stable system of explanation that does not go round and round in circles or spiral oft in an infinite regress of mysteries. Some people would much prefer the infinite regress of mysteries, apparently, but in this day and age the cost is prohibitive: you have to get yourself deceived. You can either deceive yourself or let others do the dirty work, but there is no intellectually defensible way of rebuilding the mighty barriers to comprehension that Darwin smashed. The first step to appreciating this aspect of Darwin's contribution is to see how the world looked before he inverted it. By looking through the eyes of two of his countrymen, John Locke and David Hume, we can get a clear vision of an alternative world-view -- still very much with us in many quarters -- that Darwin rendered obsolete. John Locke invented common sense, and only Englishmen have had it ever since! So if we will suppose nothing first, or eternal: Matter can never begin to be: If we suppose bare Matter, without Motion, eternal: Motion can never begin to be: If we suppose only Matter and Motion first, or eternal: Thought can never begin to be. For it is impossible to conceive that Matter either with or without Motion could have originally in and from itself Sense, Perception, and Knowledge, as is evident from hence, that then Sense, Perception, and Knowledge must be a property eternally inseparable from Matter and every particle of it. So, if Locke is right, Mind must come first -- or at least tied for first. It could not come into existence at some later date, as an effect of some confluence of more modest, mindless phenomena. This purports to be an entirely secular, logical -- one might almost say mathematical -- vindication of a central aspect of Judeo-Christian (and also Islamic) cosmogony: in the beginning was something with Mind -- "a cogitative Being," as Locke says. The traditional idea that God is a rational, thinking agent, a Designer and Builder of the world, is here given the highest stamp of scientific approval: like a mathematical theorem, its denial is supposedly impossible to conceive. And so it seemed to many brilliant and skeptical thinkers before Darwin. Almost a hundred years after Locke, another great British Empiricist, David Hume, confronted the issue again, in one of the masterpieces of Western philosophy, his Dialogues Concerning Natural Religion (1779). Can you give us any scientific grounds for your religious beliefs? Many religious thinkers, appreciating that the prestige of scientific thought was -- other things being equal -- a worthy aspiration, took up the challenge. It is hard to see why anybody would want to shun scientific confirmation of one's creed, if it were there to be had. The overwhelming favorite among purportedly scientific arguments for religious conclusions, then and now, was one version or another of the Argument from Design: among the effects we can objectively observe in the world, there are many that are not (cannot be, for various reasons) mere accidents; they must have been designed to be as they are, and there cannot be design without a Designer; therefore, a Designer, God, must exist (or have existed), as the source of all these wonderful effects. Such an argument can be seen as an attempt at an alternate route to Locke's conclusion, a route that will take us through somewhat more empirical detail instead of relying so bluntly and directly on what is deemed inconceivable. The actual features of the observed designs may be analyzed, for instance, to secure the grounds for our appreciation of the wisdom of the Designer, and our conviction that mere chance could not be responsible for these marvels. Philo, a skeptical challenger to Cleanthes, elaborates the argument, setting it up for demolition. Anticipating Paley's famous example, Philo notes: "Throw several pieces of steel together, without shape or form; they will never arrange themselves so as to compose a watch." He goes on: "Stone, and mortar, and wood, without an architect, never erect a house. But the ideas in a human mind, we see, by an unknown, inexplicable economy, arrange themselves so as to form the plan of a watch or house. Experience, therefore, proves, that there is an original principle of order in mind, not in matter" (Pt. II). When Philo presents this fanciful alternative, with its breathtaking anticipations of Darwin's insight, he doesn't take it seriously except as a debating foil to Cleanthes' vision of an all-wise Artificer. Hume uses it only to make a point about what he saw as the limitations on our knowledge: "In such subjects, who can determine, where the truth; nay, who can conjecture where the probability, lies; amidst a great number of hypotheses which may be proposed, and a still greater number which may be imagined" (Pt. V). Or perhaps isn't the world really more like a vegetable than an animal? Philo is surely Hume's mouthpiece in the Dialogues. Why did Hume cave in? Out of fear of reprisal from the establishment? No. Hume knew he had shown that the Argument from Design was an irreparably flawed bridge between science and religion, and he arranged to have his Dialogues published after his death in 1776 precisely in order to save himself from persecution. He caved in because he just couldn't imagine any other explanation of the origin of the manifest design in nature. Hume could not see how the "curious adapting of means to ends, throughout all nature" could be due to chance -- and if not chance, what? What could possibly account for this high-quality design if not an intelligent God? Philo is one of the most ingenious and resourceful competitors in any philosophical debate, real or imaginary, and he makes some wonderful stabs in the dark, hunting for an alternative. In Part VIII, he dreams up some speculations that come tantalizingly close to scooping Darwin (and some more recent Darwinian elaborations) by nearly a century. Suppose...that matter were thrown into any position, by a blind, unguided force; it is evident that this first position must in all probability be the most confused and most disorderly imaginable, without any resemblance to those works of human contrivance, which, along with a symmetry of parts, discover an adjustment of means to ends and a tendency to self-preservation....Suppose, that the actuating force, whatever it be, still continues in matter....Thus the universe goes on for many ages in a continued succession of chaos and disorder. But is it not possible that it may settle at last...? May we not hope for such a position, or rather be assured of it, from the eternal revolutions of unguided matter, and may not this account for all the appearing wisdom and contrivance which is in the universe? Hmm, it seems that something like this might work...but Hume couldn't quite take Philo's daring foray seriously. His final verdict: "A total suspense of judgment is here our only reasonable resource" (Pt. VIII). A few years before him, Denis Diderot had also written some speculations that tantalizingly foreshadowed Darwin: "I can maintain to you...that monsters annihilated one another in succession; that all the defective combinations of matter have disappeared, and that there have only survived those in which the organization did not involve any important contradiction, and which could subsist by themselves and perpetuate themselves" (Diderot 1749). Cute ideas about evolution had been floating around for millennia, but, like most philosophical ideas, although they did seem to offer a solution of sorts to the problem at hand, they didn't promise to go any farther, to open up new investigations or generate surprising predictions that could be tested, or explain any facts they weren't expressly designed to explain. The evolution revolution had to wait until Charles Darwin saw how to weave an evolutionary hypothesis into an explanatory fabric composed of literally thousands of hard-won and often surprising facts about nature. Darwin neither invented the wonderful idea out of whole cloth all by himself, nor understood it in its entirety even when he had formulated it. But he did such a monumental job of clarifying the idea, and tying it down so it would never again float away, that he deserves the credit if anyone does. The next chapter reviews his basic accomplishment. CHAPTER 1: Before Darwin, a "Mind-first" view of the universe reigned unchallenged; an intelligent God was seen as the ultimate source of all Design, the ultimate answer to any chain of "Why?" questions. Even David Hume, who deftly exposed the insoluble problems with this vision, and had glimpses of the Darwinian alternative, could not see how to take it seriously. CHAPTER 2: Darwin, setting out to answer a relatively modest question about the origin of species, described a process he called natural selection, a mindless, purposeless, mechanical process. This turns out to be the seed of an answer to a much grander question: how does Design come into existence? James Moore coauthor of Darwin A brilliant piece of persuasion, excitingly argued and compulsively readable. Its lucid metaphors and charming analogies are reminiscent of On the Origin of Species. Carl Sagan The Washington Post Book World A breath of fresh air. Richard Dawkins author of The Blind Watchmaker A surpassingly brilliant book. Where creative, it lifts the reader to new intellectual heights. Where critical, it is devastating. Richard Rorty Lingua Franca One of our most original and most readable philosophers....Once in a blue moon an analytic philosopher comes along who redeems his subdiscipline by combining professional persnicketiness with a romantic spirit, a vivid imagination, and a sense of humor. John Gribbin Sunday Times, London This is the best single-author overview of all the implications of evolution by natural selection available....Lucid and entertaining. Jim Holt The Wall Street Journal Dennett is a philosopher of rare originality, rigor, and wit. Here he does one of the things philosophers are supposed to be good at: clearing up conceptual muddles in the sciences.